In the last few weeks, I have been putting in a lot of work on the multiple WIPs I discovered in my sewing boxes; just like I said I would. 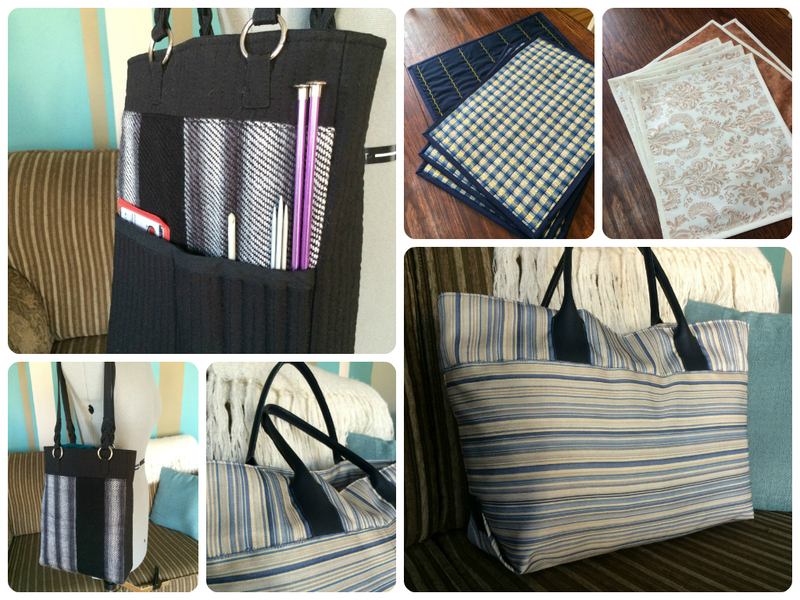 It’s been very hard to resist starting a new project but I am very proud to tell you guys that all that hard work was worth it; since I was able to finish 2 more sets of placemats, a craft bag and a big blue tote bag. Aren’t they just lovely? 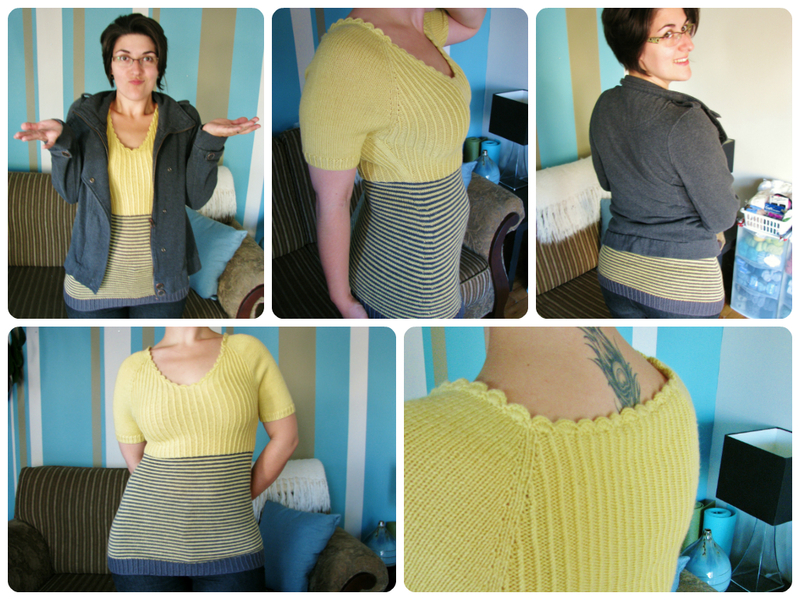 I also finished my Busy Bee Sweater earlier this week, and I am SO excited to show it to you today. It is my sweater for Very Shannon’s SSKAL14, and I (fortunately) was able to meet the September 24th deadline – although it has been extended now to October 8th. I was so sure I wasn’t going to make it, but somehow I managed to put the last stitches, weave in the ends and wash it on the 24th, and my honeybee nicely accepted to take pictures of it for me this weekend. Unfortunately for me though, even though my WIPs have been nicely transforming into FOs, I seem to have fallen victim to a streak of bad luck recently, and it’s been making my life miserable. It’s not like it’s really bad, it’s just stupid things that keep happening. I lost the pearl on my left earing while taking a bath. I knocked my head on the truck trying to pull something out. I made cheese bread, and it deflated in the oven. I dropped the couch on my feet and bruised my toes. Pulled a muscle in my neck. Had to absorb a 400$ unexpected expense. And so forth, continuously for the last couple weeks. Really, just stupid bad luck. I really hope it’s over, because I can’t take it anymore! 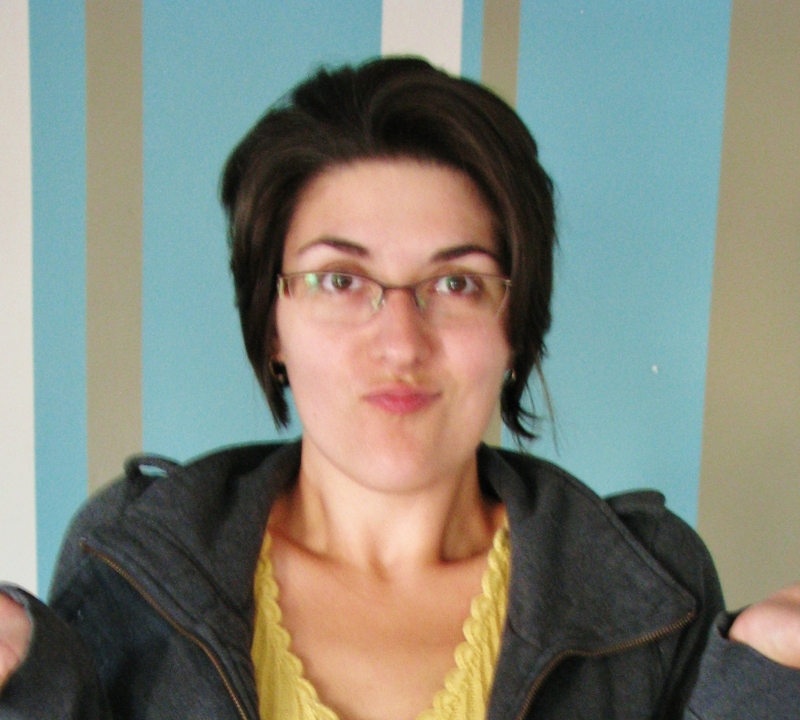 So talking about unexpected expenses… Have you noticed something new on the photos? Let’s have a closer look. 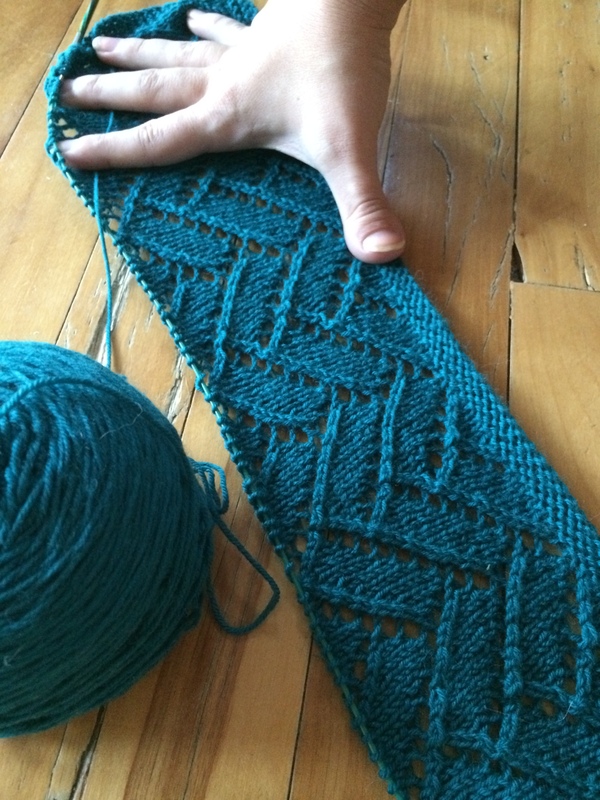 In the meantime, since I have been such a good girl finishing off all my sewing WIPs (and also because I had just finished my Busy Bee sweater), I decided to reward myself by starting a new knitting project, it’s a shawl called “Bamboo Wedding shawl” by Purl Soho. I have made one like that before for my mom, it was my very first knitted lace project. It’s a very nice, simple design that has a geometrical lace pattern that is easy to remember. I started it with Cascade Heritage yarn in Cosmo Blue, and I find it to be the perfect color for this shawl. I’m very excited about this project since it’s a nice change from all the sweaters I have been working on recently. 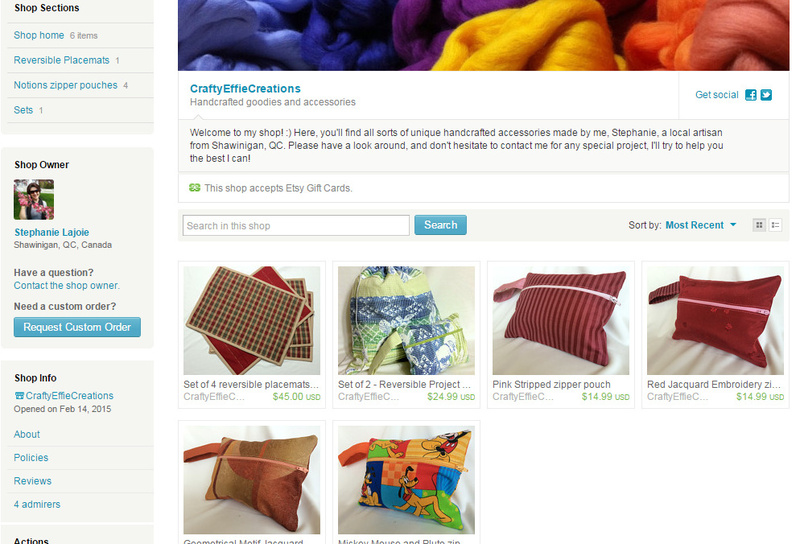 This entry was posted in Crafts, Knitting, Sewing, Slice of life and tagged bag, bee, craft, knitting, needle art, passion, placemat, sewing, stripes, sweater, tote, yarn. This month, I decided to tackle a considerable task; which is to gather and sort all my sewing supplies and to organize them in a single, sewing-dedicated room in my apartment. 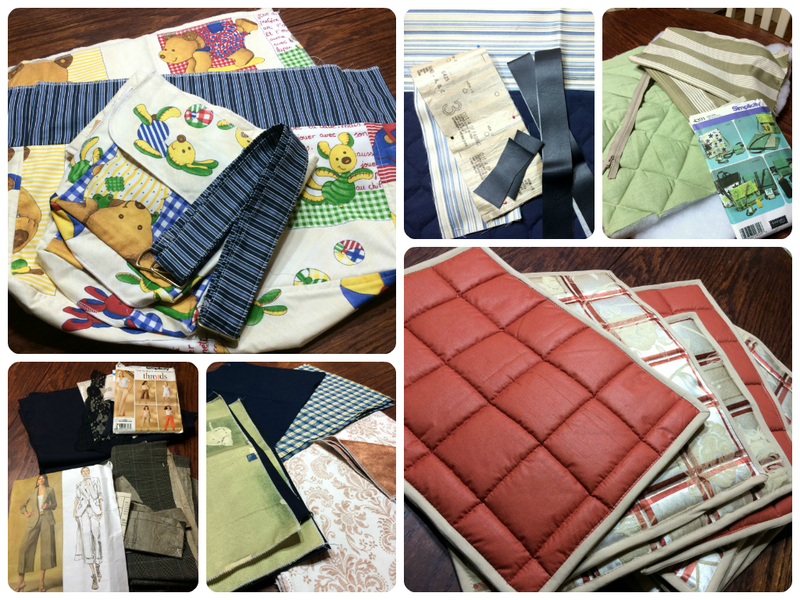 You see, I have been sewing for over 11 years now, and throughout the years I accumulated an impressive amount of fabric, patterns, notions and projects that are now scattered all over my apartment. 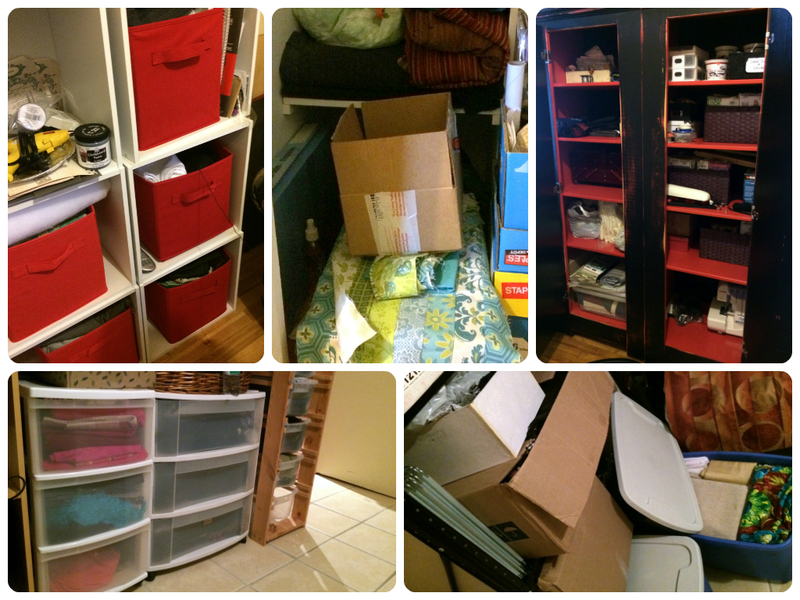 I’m sure you can appreciate how daunting of a task this can be, but if you can’t really picture it, here’s a few images of the different places I have fabric and supplies stored in. Before you judge me, I have to explain to you why my sewing things are so disorganized. It is not because I’m messy, carefree or negligent; it is simply because in a short period of 7 years between 2004 and 2010, I lived in 7 different apartments in 4 different cities, moving approximately every 10 to 18 months. During that period, most of my possessions were boxed and unpacked, to then be re-boxed, moved, and so forth a hopping number of 7 times, until I finally settled down a little over 2 years ago, coming back to my hometown. In this packing craziness, a lot of my things have been mixed, switched over, separated, reunited, used as packing supplies, etc., some of those things even stayed in boxes for YEARS, because I had no immediate need for them at the moment and I knew that I was going to move again soon anyway. So when I finally moved to my current apartment, you can imagine how much of a nightmare it was to unpack everything. I somewhat managed to concentrate most of my sewing stuff in 2 different rooms, but there is no organization system whatsoever since everything has been in such a hot mess for such a long time (heck I’m not even sure what I have anymore!). What actually triggered the adventure is that earlier this week I had to put my hands on fusible interfacing to fix the waistband of a pair of pants. Not much of a problem in most cases, but knowing how chaotic my notions are, it definitely was a problem for me. I heaved a long, desperate sigh, and started frantically looking through the countless chaotic fabric & notions containers that I have to find what I needed. I knew I had some, I just couldn’t figure out where; but somehow, no matter how hard I looked for it, I just couldn’t find it. As I finally reached the point of desperation where I was considering just going to the store to buy some more (AGAIN), I stopped myself, looked around and decided it was just time to finally do something about this horrible mess. The very same day, I started going through my bins, boxes and baskets to evaluate the damage, and in the midst of it all I discovered an impressive amount of unfinished projects; including 4 sets of placemats (yes, 4!! ), a baby bag, 2 pairs of pants, a cape, a laptop bag, 2 quilts, 2 tote bags, as well as a certain number of miscellaneous clothes that needed to be repaired or altered to my size. And I’m telling you my friends, this is only the tip of the iceberg – because there’s a lot of things in there I’m not even sure anymore what it was supposed to be. Because I have limited space in my apartment and because I like things to be neatly organized and easily accessible at all times, I decided that my “Organize-the-Sewing-Room” project just had to start by completing as many of those WIPs I possibly could; that way I’ll free a lot of space to be able to set up a better, more functional system to efficiently sort and store all my supplies. So far, I completed one set of 7 placemats (the beige/orange one on the bottom right corner), fixed 2 pairs of pants that needed to be sized down, bought assorted biais tape for the remaining 3 placemat sets and started looking for missing patterns for the bags (because yes, somehow, some of the patterns got separated from the project – don’t ask me how!). This sewing room adventure is probably going to be a very long and strenuous one, but I’m hoping to finish most of my WIPs by November, to be able to start sorting and organizing fabric and notions in December. I’ll keep you updated on my progress, but let’s hope I can have a functional sewing room by Christmas..! 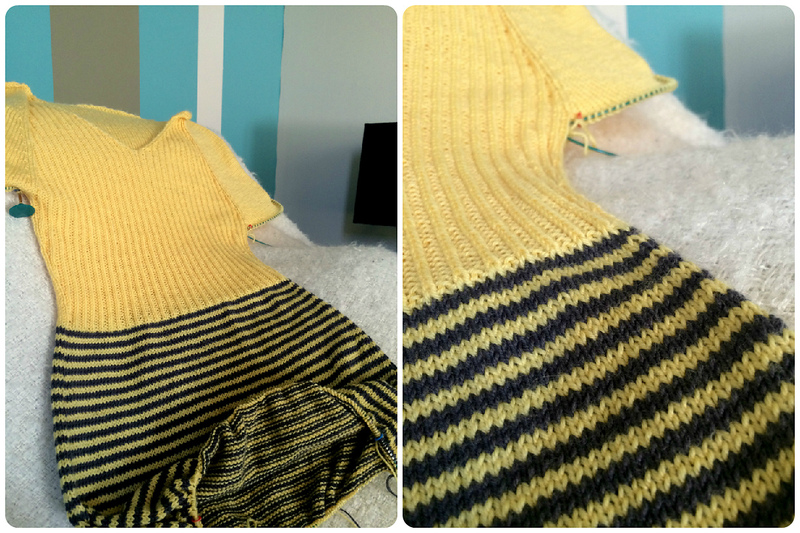 On a different note, I have also been making progress on my #SSKAL, the body of my Busy Bee sweater is almost done! Yay! 🙂 I cannot wait for it to be done and washed, so I can finally wear it! This entry was posted in Crafts, Knitting, Sewing and tagged art, bag, crafts, knitting, organize, passion, placemat, sewing, sewing room, sweater.